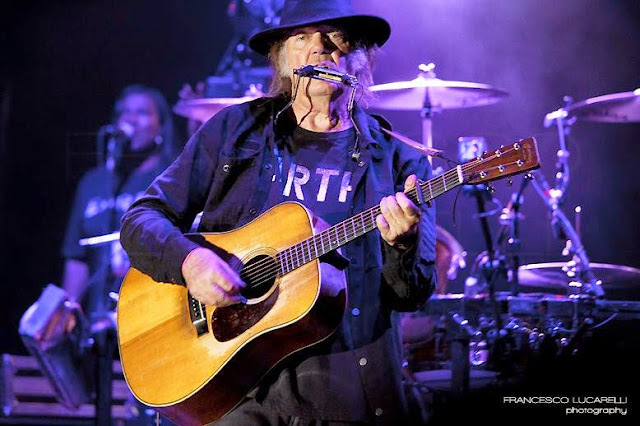 The Photo of the Moment is from Neil Young & Crazy Horse Concert @ Baralo, Italy on July 21, 2014. The second week of August is usually blocked for my second passion besides the music: historic motor racing. That's why I was booked for the Nürburgring since last year and didn't buy a ticket for the Colmar show. But after seeing Neil Young and Crazy Horse four times during this AMAZING tour, I decided to go to Colmar as well. I had to see them again! So I went to Colmar on Friday, 3.5 hrs chaotic drive, but so excited for the show! The venue was in a wine fair in Colmar, a beautiful old town in the heart of the lovely Alsace region of France. Of course I went to the venue early, even though I wasn't able to get one of those priority entrance tickets. But it's always part of the experience to meet all the Rustie friends, to get excited for the show together, to chat about concert experiences, expectations and of course to have fun! Neil Young fans are the sweetest people and so it started with a big surprise, when I was given a birthday present by my Facebook friend Tom. I was hoping for Danger Bird, as that song was on the options list and not played yet... He bought me a beautiful, beautiful belt clip, showing an eagle and said "Here you go Ruby, if he plays it or not, here you have your Danger Bird." So sweet, thank you so much Tom. It will suit my Cowgirl hat perfectly! And then queuing, mixed emotions, excited... special song tonight? , sad in a way ... last show of the tour, nervous... will I make it to the front?.. 600 people with priority tickets in front of me... ? Later we all, queuing in line had to laugh... many of the priority ticket holders just took their time, walking in, looking for a seat... phew.. I made it: second row!! First surprise: no keyboard on stage for the Magic Numbers... hmm... And then: Two of Neil's crew members came on stage! An acoustic guitar and a gorgeous voice! Little Red Rooster and DEAR MR. FANTASY! WOW!!! Another song and off they went. The crowd was wooing! What a performance! Later we heard, that the Magic Numbers didn't make it to Colmar, cause their bus broke down. What a wonderful idea to have these two great musicians instead! Love And Only Love ...will endure. ... could be the message of that tour! Second song, first surprise: Be The Rain! What a version of that song. I LOVED Rick Rosas' bass playing on that one! We've got to save Mother Earth! So true! We! No one else! Expecting Love To Burn after that... first chord. .. WOW! Down By The River! Much shorter than the versions I saw before on this tour, but so intense, like a psychedelic journey 'out of my mind'... and the crowd making it so soulful in responding during the repeated "Be on my side" sequence "I'll be on your side", Neil taking it up... for minutes. .. still sends chivers down my spine... no one I talked to and also I never experienced a crowd responding that way during that song. .. moment of the night for me! Name Of Love. .. do it in the name of love... yes we should. .. always! And then the most beautiful bass line started... Rockin' In The Free World! Rick smiling, seeing him playing bass on that song was the highlight of that tour for me! (with best wishes to Billy on my mind). Who's Gonna Stand Up.... it was clear when that song started, that this would be the last song, ending with the last chord of that OUTSTANDING, AMAZING tour... waving, bowing, a quite short Who's gonna stand up with the crowd... Off they went! It felt unreal for a moment, that this was it! 10 thoughts on my mind at the same time. .. Thank you Neil, Poncho, Rick, Ralph, YaDonna and Dorene! PS: No word from Neil during that show. .. not even one! He was so focused on the music... But during Blowing in the Wind and Who's gonna stand up he looked me in the eyes, directly, for a couple of seconds... no words needed. ... We're all one song! Thanks so much Ruby Inthedust. Wonderful word imagery which we love here @ TW. Hope you make the next tour and can bring us back of your reports to share with our beloved TW readers. And here's the Video of the Moment from Neil Young & Crazy Horse Concert @ 2014-08-05, Lokerse Feesten, Lokeren, Belgium by the ever generous, sharing buddy Roel of radio of the rusties.